The Internet sometimes pops up with things you would never expect. Led to your web page for a completely different reason, I found several paragraphs from various people who reviewed the legendary story about Western Union rejecting a chance to buy the Bell Telephone patents for $100,000 in 1876 or 1877 due to a faulty evaluation by their own technical experts [see "The Greatest 'Bad Business Decision' Quotation That Never Was" and "More on the Greatest 'Bad Business Decision' Quotation That Never Was"]. Several people asked "Where did that letter by the WU experts come from? Is it genuine?" They noted that it was quoted in an IEEE Engineering Management journal in 1965 (approximately) by some guy named Richard C. Levine. One of them said "Levine was born in 1939. Is he still alive?" Well, yes, he is still alive. See signature below! He has had a long career in telecom, having jobs at AT&T Bell Labs and Northern Telecom, to mention just a few. He has had about 15 patents issued during the past 50 years, and is still inventing and seeking venture capital today. He also has been an adjunct Professor of electrical engineering at Southern Methodist University in Dallas Texas for over 20 years. He teaches a course in digital telecommunications technology from time to time. In connection with that course he still distributes copies of the quoted article. You can find a more recent version of the article, with some historical notes at http://www.lyle.smu.edu/~levine/ee8320/wulet.rtf. I suggest in particular that you read this 1976 article in the IEEE Spectrum by Michael Wolff that is mentioned in the above document. Also the following report is historically interesting as well: http://faculty.insead.edu/adner/research/Wester%20Union%20case%20sample.pdf. In response to the question about where I got the letter: I put it together from two similar but not identical versions. One was widely known among engineers and business people in the late 1950s and early 1960s in the Boston area. I even saw a framed copy of the first version on the office wall of Richard E. Dolbear, an electrical engineer and expert on high voltage power systems, who was, by interesting coincidence, the grandson (or great grandson?) of Prof. Amos Dolbear. Amos Dolbear was a professor of science at Tufts Universisty, and he was one of the competitive inventors of a working telephone system in the 1870s, that appeared in the court records of the famous telephone cases. Dolbear's telephone was one of the first devices to use a variable capacitance microphone. The Internet is indeed a funny (and small) place. 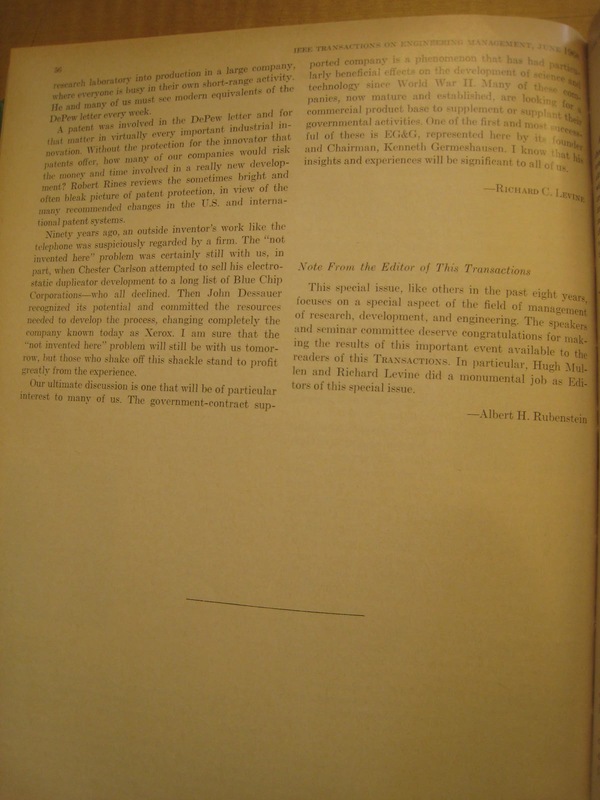 If you’re at all interested, be sure to check out the 1976 Michael Wolff IEEE Spectrum article that Richard mentions above – it appears to settle the matter definitively. But they did invent or discover an astonishing number of other things: negative feedback amplifiers, the transistor, cosmic background radiation, the laser, the UNIX operating system, the list goes on. Bell Labs amassed 13 Nobel prizes between 1937 and 2000. As I've delved into telephone history for my phone phreaking book I've been amazed at how many technical challenges Bell Labs and the Bell System encountered and overcame. Be warned, the innovatoins are going to come at you pretty quicky. Score one point for every name or innovation you're familiar with. I read your blog entry on "The Greatest 'Bad Business Decision' Quotation That Never Was" with some interest and decided to do a bit more digging. The article you reference, "Interdisciplinary Aspects of Engineering: The Environment of Concept Engineering", IEEE Transactions on Aerospace and Electronic Systems, Volume AES-6(2), pp. 112-118, March 1970, is definitely not an April Fools joke. It uses the Depew letter to highlight the dangers of "gradualism in the face of a really new concept" (p. 112). 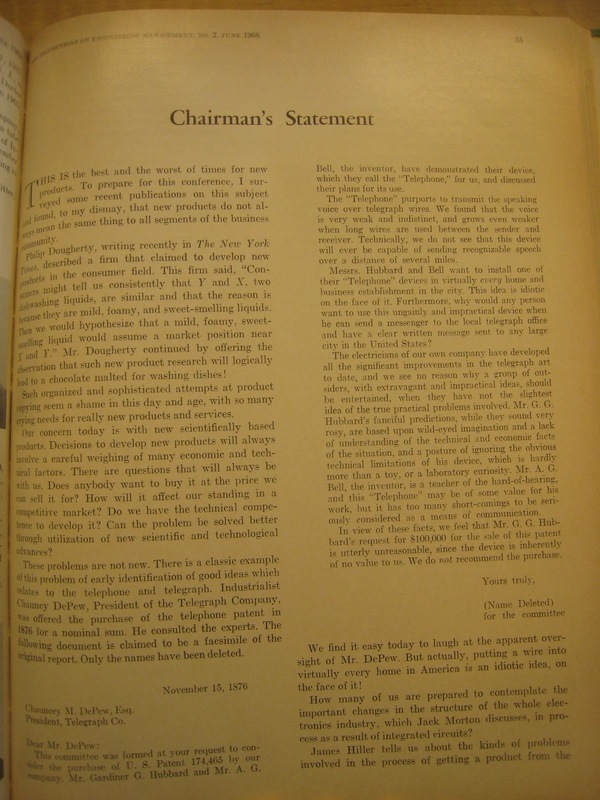 The letter itself was reproduced from an earlier IEEE publication: Richard C. Levine, "Chairman's Statement", IEEE Transactions on Engineering Management, Volume EM-15(2), pp. 55-56, June 1968. Photos of its two pages (courtesy of the San Francisco Public Library) can be found here and here. "These problems are not new. There is a classic example of this problem of early identification of good ideas which relates to the telephone and telegraph. Industrialist Chauncy DePew, President of the Telegraph Company, was offered the purchase of the telephone patent in 1876 for a nominal sum. He consulted the experts. The following document is claimed to be a facsimile of the original report. Only the names have been deleted." Therein follows the same letter that has been reproduced many times over. There is unfortunately no reference given to any prior published work so one can only wonder where or how Levine came into possession of the letter. It is possible that Mr. Levine is still alive. He was born in 1939 according to his biography in the same volume and was a member of Eta Kappa Nu, Tau Beta Pi, Sigma Xi, and the American Association of Physics Teachers of the American Institute of Physics. At the time of publication he was Associate Professor of Electrical Engineering at the Stevens Institute of Technology in Hoboken, NJ. Perhaps he can be tracked down to see if he has any recollection of writing this 44 years ago! I also found an amusing note in the New York Times regarding Mr. Depew. On August 27, 1893 there is an article titled "Under 10,000 Wheels - People Marvel at Sights in Palace of Mechanic Arts". It makes special note that Depew sent a special message via telephone congratulating the organizers of the event. One last note about the article you found from 1898: it was also published in the Los Angeles Times on January 20, 1898, giving credit to the New York Tribune. Thanks, Sam, for the thorough research. Much appreciated! It was 1876. 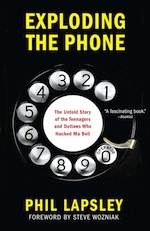 Alexander Graham Bell had just sent speech down a wire through a newfangled gadget -- the telephone. Bell, his assistant Thomas Watson, and his investors, Gardiner Hubbard and Thomas Sanders, turned their attention to commercializing their invention. It’s an absolutely awesome quote, perfectly capturing the stupidity and arrogance of an entrenched monopoly in dismissing an upstart disruptive technology. The only problem is, the quote isn’t true. It’s a made-up blend of several different, but related, stories. Come with me on a Google Books inspired detective trip down truth-in-memory lane. Where'd You Get That Quote? Regardless, it was repeated in Telephone Engineer and Management, Volume 79, in 1975, and spread thereafter. Kind of weird that a quote that beautiful would just magically appear on scene in 1970 1968, never having been mentioned anywhere before. Again, kind of odd that this just appears suddenly in 1910 from a single source (Casson) with no citations and no mentions prior to that. But Who Was Chauncy M. Depew? The beautiful quote that opens this blog post mentions a Chauncy M. Depew, “President of the Telegraph Company – the ancestor to Western Union.” Just who was this mysterious man with such a great 19th century name? Chauncy M. Depew was (if Wikipedia can be believed) an attorney, the President of the New York Central Railroad System, and a United States Senator from 1899 to 1911. When I returned to Mr. Hubbard he again convinced me, and I would have made the investment except that Mr. Orton called at my house that night and said, “I know you cannot afford to lose ten thousand dollars, which you certainly will if you put it in the Bell patent. I have been so worried about it that contrary to my usual custom I have come, if possible, to make you promise to drop it.” This I did. So: our Mr. Depew was not the “President of the Telegraph Company”, but rather someone who was a good acquaintance of both Bell and Orton. And although it wasn’t $100,000, it was $10,000. 2. But we do know that the beautiful quotation ain't right. 3. We also learned, for the umpteenth time, not to believe everything we read on the Internet.